I've had this problem for awhile on IOS 11.3 and 10.x.x. When i go to look at the battery usage no APPs are showing up as being used but the totals show usage, in attached photo 1:28 hours. How come there are no APPs showing up as being used for this time? My phone is an iPhone X. I want to say I had the same problem on my iPhone 7 also. My iPad Pro 9.7" shows APP usage and both devices are setup the same. It takes time for iOS to calculate the app usage. You’ve recently charged your phone from the look of it. Anytime you charge your phone for a significant period of time iOS clears out the app usage list until your phone has been off the charger for a while. It needs that time to calculate the percentage of usage, and it needs to read the battery drain to do that. So your saying 1 hour and 28 minutes is not enough time to track battery usage? My 7+ on iOS 11.3.1 shows tabs under Battery Usage for Last 24 Hours and Last 7 Days and has many Apps under either tab. Currently shows Usage under Time Since Last Full Charge at 4 minutes. I haven't figured out yet how to do a screen shot. Posting using my PC rather than my phone. That’s the problem I’m seeing. I so usage, 1 hour and 28 minutes but no APPS are showing up. I don’t use the phone a lot so I’m wondering why the usage is showing 1 hour and 28 minutes with no APPs showing up. Here is a screen shot from my iPad Pro. It show 35minutes of usage and all of the APPs I have used. That is 1 hour 28 minutes since the last **full** charge. Have you plugged in the phone for brief periods since the last full charge? I suspect so, with 69 hours of standby with a phone that appears to be more than half charged. One thing to try is to restart the phone. But, if that doesn't restart tracking, I'd suggest plugging in until the phone is fully charged and then see if app tracking restarts. I was going to say this as well. With the standby time I would assume you only partially charge your phone throughout the day. 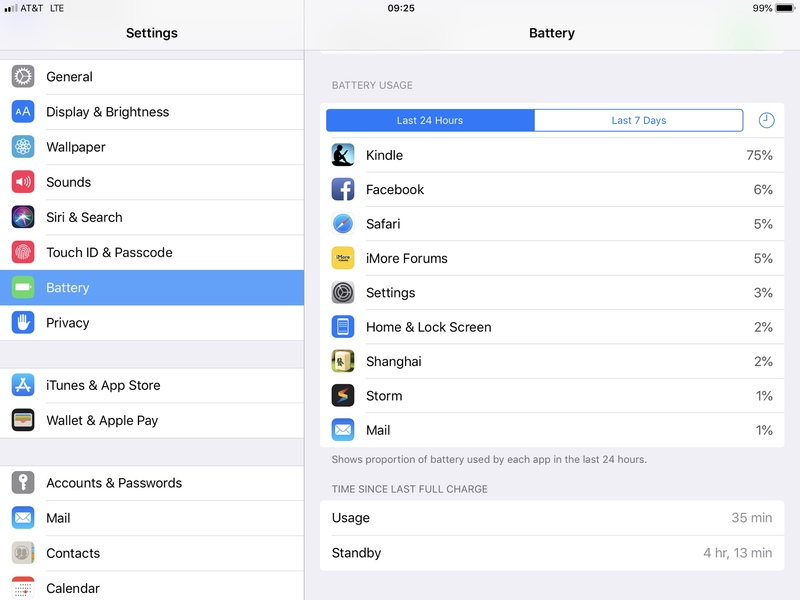 That’s what is really causing iOS to constantly recalculate the battery usage stats. I’ve seen it in the past when I’ve done multiple partial charges throughout the day. I could also recommend restarting your phone, and also charging to full whenever you do charge. I've had this problem for awhile on IOS 11.3 and 10.x.x. I've had this exact same issue on my iPad 9.7 2017!!! It has had the issue since I took it out of the box brand new, starting with iOS 10.x.x. It was like that when I took it out of the box and updated it for the first time (after playing with it for over an hour). When iOS 11 came out in beta I installed that and still had the same issue. I cannot tell you how many times I factory reset the device, and nothing has fixed it. It's random. Sometimes I'll go look at the battery and it will have all kinds of stats. Then I'll go to look at it 2 minutes later and the entire page will be blank just like in your snapshot. Well I spent a couple of minutes on a chat with Apple Support yesterday. Since I wasn’t home at my computer there wasn’t too much they could do. It ended with the expectation of resetting my iPhone X and recovering via the latest backup. Well I w not ahead and reset the phone to new and reinstalled everything manually instead of using a backup. So far so good. I’ll give it a couple weeks before I call the problem solved.